Why do we need biological filters? We use biofilters to help maintain water quality in recirculating or closed loop systems. Biofilters are also used to improve water quality before water is discharged from a facility. There are many different methods of maintaining good water quality and biofiltration is only one component of the total picture. It is however, a very important and essential component especially for recirculating aquaculture or aquarium systems. How will biofilters help us? Depending on design and application, biofilters have the ability to accomplish the following functions. The first three functions are performed by biological means and the last four are done by physical processes that do not depend on living organisms. In general, there are three types of aerobic microorganisms that colonize biofilters for aquaculture. Heterotrophic bacteria utilize the dissolved carbonaceous material as their food source. Nitrosomonos sp. bacteria utilize ammonia as a food source and produce nitrite as a waste product. Nitrospira sp. utilize nitrite as a food source and produce nitrates as a waste product. Nitrosomonos and Nitrospira will both grow and colonize the biofilter as long as there is a food source available. Unfortunately, both of these types of bacteria are relatively slow growing. Heterotrophic bacteria grow about 5 times faster and will out compete the other two types for space if food is available. Since most aquaculture biofiltration systems are designed for the purpose of converting and removing ammonia from the water this presents a problem. There are three ways to deal with this problem. The first is to remove most of the carbonaceous BOD (biological oxygen demand) before the water enters the biofilter. The second method is to provide sufficient extra capacity (surface area) in the biofilter to allow all of the various bacteria to grow. Another method is to have a very long plug flow path through the biofilter. This allows different zones of bacteria to establish themselves in different parts of the biofilter. There are 4 main types of aerobic biological filters and several subcategories of each. Here is a listing of the major types. III. Fluidized Bed Filters A. Sand Filters B. Bead Filters IV. Fixed film A. Rotating Biological Contactors (RBC) B. Trickling Filters C. Submerged Filters (with or without aeration) 1. Up flow 2. Down flow 3. Horizontal flow 4. Moving Bed Anaerobic filters can also be defined as biofilters but they are never the main biofilter used for maintaining water quality in the culture system. There are two main reasons why they are not suitable. The number one reason is that they are not capable of effectively cleaning the water to the level required. The other reason is that they operate too slowly. There is however, a couple possible uses for anaerobic filters in aquaculture. Theoretically, one could use an anaerobic filter to convert the nitrates into N2. However, this is a difficult process to control and it is generally less expensive to replace a small amount of water to remove nitrates. Anaerobic biofilters are best suited for processing high strength waste. The sludge produced by the physical filter system is an example of a high strength waste. Processing plant wastes are another candidate for anaerobic digestion. In an integrated production/processing plant these two streams could be combined. The best feature of anaerobic systems is the production of methane. There are specially designed engines that can burn this gas to produce electricity. Using the gas to heat water is another obvious possibility. However, the capital cost of these systems generally limits their use to large operations. General Water Quality Maintenance Principles Not all aquaculture applications have the same requirements for biofiltration. Not only do crops vary in their requirements but different farmers may grow the same crop under different conditions. The biofilter is only one of several components of the system used to maintain water quality. The functions that the biofilter must perform are determined by the presence and effectiveness of other components. Here are some other components and their effects on the system. Aeration or oxygenating systems If the fish don’t have oxygen you are out of business no matter what else you do. Aeration is always the first step when increasing carrying capacity over an open, lightly loaded system. Mechanical surface aerators, subsurface air bubblers and pure oxygen injection is the typical progression in terms of technology and complexity. All aerobic biofilters require oxygen to operate. If the biofilter does not provide its own oxygen, it will be limited to the oxygen carried in with the water. Particulate Filters Once sufficient oxygen is provided, the next easiest way to improve water quality is to remove suspended solids. This is a more difficult task since particles come in all shapes, sizes and densities. Suspended solids consist primarily of uneaten food and feces which are slightly denser than water. Large particles, above 100 microns, will settle out quite easily. Particles above 50 microns can be filtered out with a screen. Particles below 10 microns are difficult to filter and are generally removed by some other means. There are many different types of particulate filters that can remove suspended solids. They generally fall into three broad categories. The first type are settling basins, tube settlers, plate settlers, swirl separators and similar systems that allow the particles to drop out of the flowing stream by gravity. They are relatively simple devices and they work well on large particles. Settling systems generally have very low pump head requirements. The second type are sand filters, sock filters, drum filters, disk filters, belt filters and similar systems that mechanically remove the particles from a flowing stream. These types of systems “screen” the particles. The size of particle removed is dependent on the size of the screen or sieve. Pump head requirements can vary from low to very high. Some biofilters such as bead filters claim to do both particulate filtration and biological filtration. The third type of particulate filter is the floatation or bubble seperator. These are commonly known as protein skimmers. In this device, air is bubbled into a column and the fine particles become attached to the surface of bubbles. The resulting froth or foam is collected and removed from the system. These devices require a certain amount of surfactant type compounds in the water in order to work properly. Although they are not typicaly designed for solids removal, some submerged biofilters will tend to collect fine particles due to the sticky nature of biofilms. This can be both a benefit and a maintenance problem. If the biofilter is not designed for easy cleaning, solids collection can represent a maintenance headache. Removal of suspended solids is important since suspended solids comprise the majority of the BOD (Biological Oxygen Demand). The BOD not removed by the particulate filtration system must be removed by the biofilter before effective ammonia removal will occur. Thus the size of the biofilter is influenced by the effectiveness of the particulate filter. The way that solids are removed is also important. The best systems remove solids quickly without degrading them in any way. If the solid particles are broken or reduced in size, it makes it easier for nutrients to dissolve into the water. These nutrients must then be removed by another part of the water treatment system or flushed out by water exchange. Time is also important because the longer solids are held in the system, the more degradation will occur. Floating bead filters are particularly bad in this regard since they hold the solids for long periods of time before backflushing. Foam Fractionators Foam fractionators are very useful but sometimes optional pieces of equipment. They are good at removing small particles (under 10 microns) and surface active compounds. They are sometimes referred to as protein skimmers. Since proteins are nitrogenous compounds that degrade into ammonia, foam fractionators can reduce the load on the biofilters. They are definitely useful in systems where water clarity is important. Foam fractionators also add oxygen to the water as a secondary benefit. Unfortunately, foam fractionators do not always work well in fresh water. Ozone Ozone is a powerful oxidizer and sterilant. It is potentially harmful to fish, humans and most living organisms. It is definitely harmful to biofilters. It is used to improve water clarity and reduce disease transmission. Ozone should never be used directly before a biofilter. If ozone is used upstream of a biofilter, there should be sufficient retention time after the injection point to insure that no ozone residual enters the biofilter. UV light Certain wavelengths of UV (Ultraviolet) light can be used as a sterilant. UV light is often used with ozone. UV light and ozone are complimentary and synergistic. Carbon dioxide strippers Build up of CO2 can be a serious problem in a heavily loaded, intensive recirculating system using pure oxygen. The choice of biofilter has a direct influence on the degree to which CO2 is a problem. In general, any biofilter other than a trickling filter will have a CO2 problem when pure oxygen is used rather than compressed air for aeration. Building a CO2 stripper is not a difficult task but it must be included in the overall design of the system. In order to remove carbon dioxide, there must be a large interfacial area between air and water. The interfacial area can be increased through the use of subsurface aeration, mechanical surface aerators, spray systems or packed columns. Subsurface aeration is not very efficient and mechanical surface aerators are difficult to use in an intensive recirculating systems. Spray systems can be big energy users and they are not very efficient either. The best choice for intensive and space limited systems is the packed column. Packed columns can be either cross flow or counter flow systems. Packed columns for CO2 stripping require fans to either force (push) air in or induce (pull) air through the packing. Characteristics of the “Ideal” Biofilter Before we examine each type of biofilter, it would be useful to define the characteristics of the ideal biofilter. The following characteristics can be considered a checklist that we can use to rate each of the different types. In some cases, different features may be mutually exclusive but we can use the ideal characteristics as a yardstick or goal. In practice it may be necessary to trade off one feature for another but it doesn’t hurt to know what the ideal should look like. 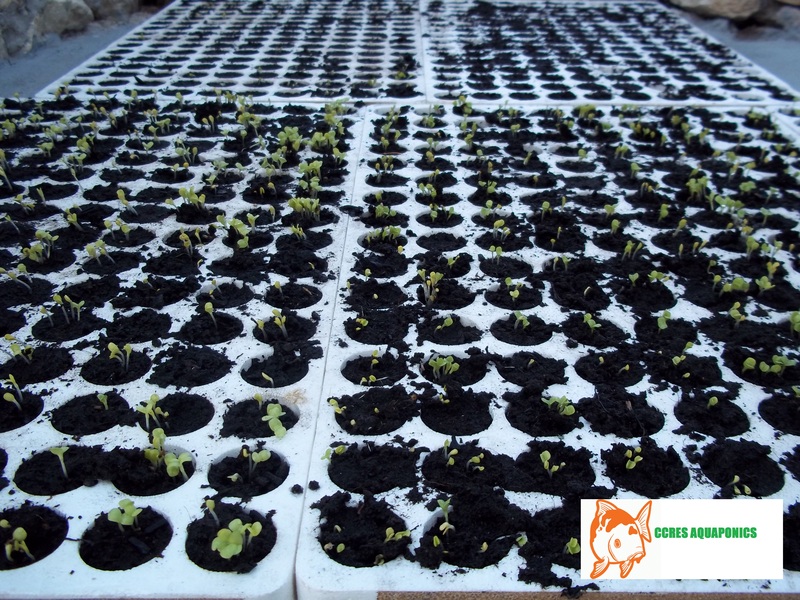 The following list contains most of the pertinent features of a good biofilter. 1. Small footprint – The biofilter should occupy as little space as possible. It is common to have culture tanks and the biofilters under cover for protection and temperature control. Space allocated for biofilters takes away area that could be used for culture tanks. 2. Inert materials of construction – All materials used in the biofilters should be non-corrodible, UV resistant, resistant to rot or decay and generally impervious to chemical attack. In general, marine grade construction materials are required for reasonable working lifetimes. 3. Low capital cost – The biofilter must be inexpensive to purchase or build and cheap to transport to the farm location. 4. Good mechanical strength – The biofilter and its components must be tough enough to withstand the normal wear and tear of a industrial/agricultural environment. 5. Low energy consumption – The energy cost (usually electricity) to operate the biofilters should be as low as possible. The largest energy users are the pumps to move water and compressors to move air. 6. Low maintenance requirements – The biofilters should be self cleaning with little or no care required for the normal life of the crop. 7. Portability – The biofilters should be easily movable to facilitate changes in operation of the facility. 8. Reliability – Ideally the biofilters should have no moving parts that could fail at an inopportune time. If the biofilters does have moving parts, they should be rugged and designed for a continuous operating life of several years. 9. Monitorabilty – It should be easy to observe the operation of the biofilter to insure that it is operating correctly. 10. Controllability – It should be easy to change operating variables to assure optimum performance. 11. Turndown ratio – The biofilters should be able to work under a wide range of water flow rates and nutrient loading levels. 12. Safety – The biofilters should not have any inherent dangers to either the crop or the owner/operator. 13. Utility – The biofilters should accomplish all of the goals set forth in beginning of this paper i.e. removal of ammonia, carbon dioxide, BOD, suspended solids etc. 14. Scalable – A small system should work the same way as a large system. The performance per unit volume should be constant regardless of the size of the system. Now that the characteristics of the “ideal” biofiltration packing have been established, it makes sense to compare the existing medias to that standard. Characteristics of Real Biofilters Activated Sludge Systems Activated sludge systems are not common in aquaculture systems. Activated sludge systems are good at removing carbonaceous BOD in systems with high nutrient loadings. They are commonly used in domestic waste water treatment systems. Activated sludge systems are typically expensive to operate and do not provide the effluent water quality necessary for aquaculture. Aquatic Plant Systems Plants are not normally used for the primary biofilter in aquaculture systems. They do however provide a very good sink for the nitrates produced by a well functioning biofiltration system. The marriage of recirculating aquaculture systems and hydroponics are a good example of efficient use of resources. In addition to commercially valuable plants grown in hydroponics systems, aquatic plants such as hydrilla, cattails, water hyacinths and duck weed can be used to absorb nitrates and phosphorus from waste water. Unicellular plants (algae, diatoms etc.) are sometimes allowed to grow in the culture tanks. Some species such as tilapia are tolerant of poor water quality and can use the algae as food. Systems operated this way are sometimes called “green water” systems to distinguish them from the clear water systems that many species require. Green water systems can be a very cost effective way to culture certain species but they are not recommended for beginners to aquaculture. Management of these systems requires some experience and specific knowledge. Fluidized bed sand filters Regular sand filters such as the type used for swimming pool filters or potable water filters are virtually worthless as biofilters for aquaculture. The biofilm quickly fills the spaces between the grains and the pressure drop across the filter rises rapidly. Frequent back flushing is required and the active biological film is removed each time. In contrast, fluidized bed filters have been successfully used for aquaculture applications. A sand filter becomes fluidized when the velocity of the water flowing up through the bed is sufficient to raise the grains of sand up and separate each grain from its neighbors. In hydraulic terms, the drag on each particle is sufficient to overcome the weight of the particle and the particle is suspended in the stream of water. The velocity required to fluidize the particle is a function of the shape, size and density of the particle. Fluidized bed sand filters have several very good advantages. 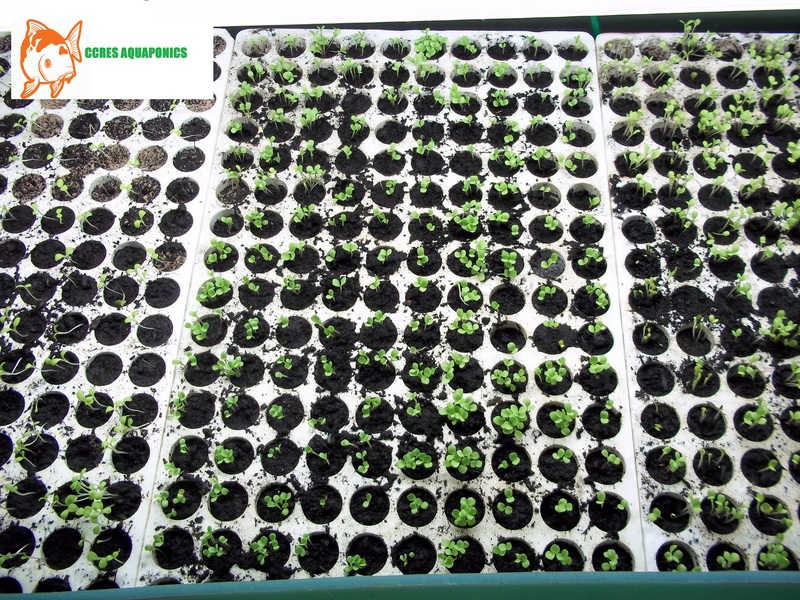 They pack more biologically active surface area into a given volume than any other type of biofilter. In addition, the best shape for a fluidized bed sand filters is a tall column. Thus they have a small foot print for a given capacity. They are self cleaning and relatively tolerant of different nutrient loadings. There are also several disadvantages and potential problem areas with fluidized bed sand filters. The fluidized bed sand filter has a relatively high energy requirement because of the high pressure drop necessary to fluidize the sand. 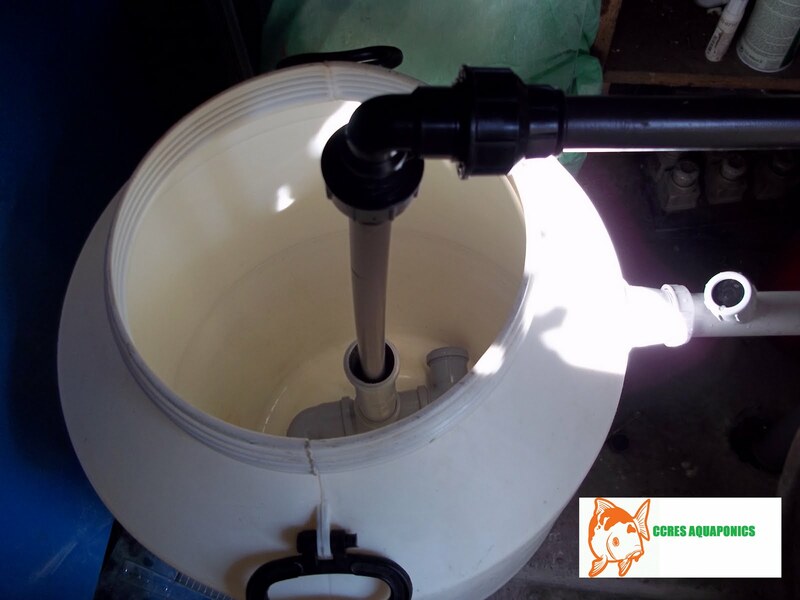 The other main problem with sand filters is that the pressure required to fluidize the bed varies depending on the amount of biofilm on the sand particle. As the biofilm builds on the sand particle the size of the particle increases while the density of the particle decreases. This means that the depth of the bed will tend to increase as the bed ages. It also means that the bed depth will fluctuate as the loading on the bed varies. In order to prevent blowing the sand out of the tank, the tank must be oversized or the flow of water needs to be regulated. Another potential problem is the uniformity of the water flow. In order to completely fluidize the bed, the water needs to be evenly distributed across the whole bed. Two things can happen if the flow is not uniform. One possibility is that the water will channel and short circuit though the bed. This means that the treatment capacity will plummet. Another possibility is that the short circuit will happen near the wall of the vessel and the abrasive sand will eat a hole through the wall of the vessel. Fluidized bed sand filters are limited to the oxygen carried in with the water. This means that the water entering the filter should have a high level of oxygen in order to insure a good level of treatment. Bead filters Bead filters are a relatively new type of biofilter. 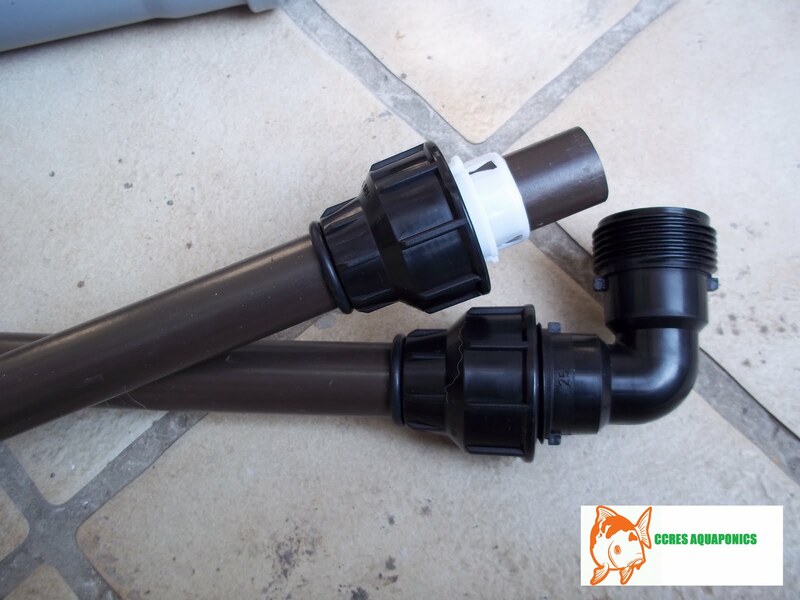 They are advertised as the complete solution to water quality for recirculating systems. They consist of a closed vessel partially filled with small beads of plastic. Usually the vessel is filled with water and the beads float at the top of the vessel. Water flows up through the bed of beads. The beads are small enough to trap most large suspended solids. In addition, the surface of the beads supports the growth of a biofilm. The small size of the beads means that they have a relatively large surface area per unit volume. The more sophisticated systems incorporate a mechanical stirring devices such as a propeller on a shaft. Periodically the water flow is shut off and the bed of beads stirred to dislodge the suspended solids. The solids are allowed to settle into the bottom of the vessel and then drained off. This ability to remove suspended solids and act as a biological filter is the main advantage to bead filters. The difficulty in successfully operating bead filters lies in striking a balance between the competing functions. Too frequent washing to remove solids dislodges the biofilm and disrupts the nitrification process. If the beads are not washed enough however, the solids start to plug the bed. The other potential problem is the presence of large amounts of carbonaceous solids which tends to encourage the growth of heterotrophs at the expense of nitrobacter sp. and nitrospira sp. Another drawback to bead filters is their relatively high energy consumption due to their high pressure drop. Also, the water flow and pressure drop are not constant. As the bed of beads becomes loaded with solids, the pressure drop rises and the water flow decreases. This leads to cyclic rather than constant performance. Since bead filters are not aerated, they are limited to the oxygen carried in with the water. In general this is not a problem since retention times are low. Bead filter systems are probably suitable for small, lightly loaded systems where labor costs are low. At this time they are not available for large systems except as multiple units. RBC (Rotating Biological Contactors) Like much of the equipment used in aquaculture, RBC’s were first used in domestic sewage treatment applications. There are several different types that are manufactured. A typical design consists of plates or disks that are attached to a horizontal shaft. The shaft is located at the surface of the water and it is turned at a very slow speed (1-5 rpm). The disks are half submerged in the water at all times. As they rotate, the biofilm attached to the surface of the disk is alternately exposed to air and then submerged in the water. The original designs used an electric motor to turn the shaft. 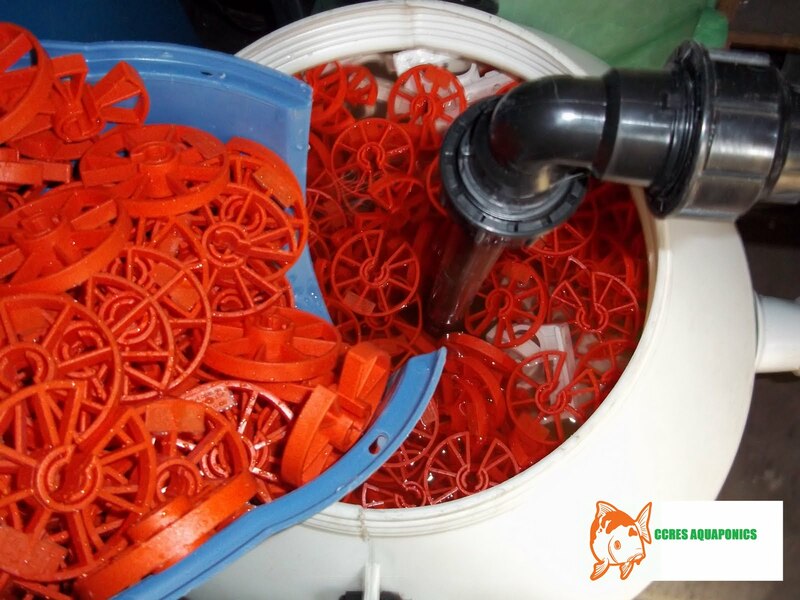 There is a new design specifically for aquaculture that uses compressed air or pumped water to drive a paddle wheel in the center of the cylinder. These RBC’s float in the water and do not require bearings or elaborate mechanical supports. RBC’s have many advantages. They offer excellent treatment efficiencies. They require very little energy to operate and can be located in the culture tank to save space if necessary. They do not require additional oxygen and are not limited to oxygen contained in the incoming water. They can remove dissolved BOD or ammonia depending on nutrient levels. They are biologically robust and handle shock loads well. It is easy to observe their operation and visually monitor the biofilm. They only have one major drawback besides cost and that relates to reliability. If there is a power failure or the cylinder stops turning for any reason, the biofilm exposed to the air can dry out. When this happens, the cylinder will be unbalanced and become difficult to turn. Trickling Filters Trickling filters are one of the oldest types of biological filters. Trickling filters filled with rock or coal were built in the late 1800’s for sewage treatment. Trickling filters typically consist of a packing or media contained in a vessel. The water to be treated is sprayed over the top of the media and collected in a sump underneath the media. The surface of the media or packing provides the substrate for the growth of a biofilm. In some systems, air is forced into the filter with a fan. However, most filters rely on natural convection and diffusion to move air throughout the filter. Trickling filters are rugged and easy to operate. They have the ability to treat a wide variety of nutrient levels. Properly designed systems can handle solids very well. One of the big advantages of a trickling filter is that the water can leave with more oxygen than it entered. Because trickling filters have a large – air water interface, they also act as strippers to remove CO2, H2S, N2 or other undesirable volatile gases. The only major drawback to trickling filters is the energy cost required to pump the water to the top of the filter. A high narrow filter will save space but take more pumping energy. A wide low filter will use less energy but take up more space. The first step in the design of a trickling filter is to pick the right packing or media. Over the years many different materials have been used for trickling filters but today, the best packing is structured media. Structured media is composed of sheets of rigid PVC that are corrugated and glued together to form blocks. For an in depth review and analysis of packing materials, refer to the paper “A Review of Biofiltration Packings”. One of the advantages of structured media is it’s flexibility and ease of use. Structured media can be used to build a convenient biofilter without a vessel. Since the vessel is typically the major cost of a biofilter, a biofilter with no vessel can be a real money saver. Structured media can be stacked on a frame work or any flat surface. It can be located over a culture tank or have its own water collecting sump. No sides are required because the packing is self supporting. The most important requirement in the design of any trickling filter is a good water distribution system at the top. There are two common ways to do this. A pressure spray system with splash guards at the top is probably the simplest. The only drawback is the additional pressure drop required to operate the nozzle. The other system involves the construction of a shallow water distribution pan with several gravity flow target nozzles in the bottom of the pan. Here are some typical arrangements for a “vessel-less” trickling filters. Figure 1. Trickling filter with pressure nozzle distribution system. Fig. 2. This is a trickling filter with gravity flow target nozzles in a shallow water distribution pan. Submerged Bed Filters Submerged Bed Filters are familiar to anyone who has owned an aquarium. An under gravel filter is a classic down flow submerged bed filter. 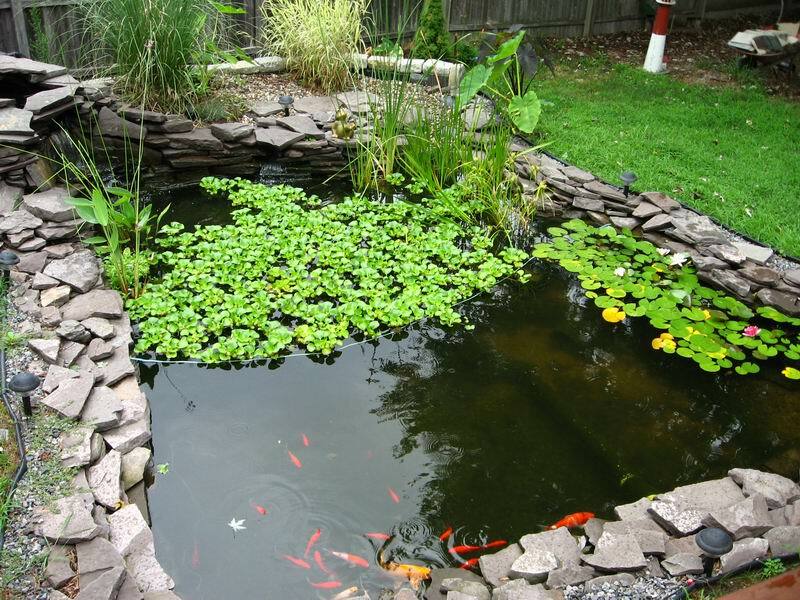 Submerged bed filters have been used extensively for small scale aquaculture and backyard water feature systems. These filters can be operated in up flow, down flow or cross (horizontal) flow. The classic (old) systems consisted of gravel with an under drain system. An improvement to these systems was the addition of air piping underneath. The air was used to ‘bump’ the filter to dislodge solids and restore full flow. The problems with these filters is the large size, low void fraction, tendency to plug and extremely high weight. In general, these old gravel based systems are not suitable for modern aquaculture. Modern submerged bed filters are very efficient, have low head loss and are very easy to build and maintain. The key difference is the type of media and the water flow path. A modern submerged filter uses structured media in a cross (horizontal) flow mode. 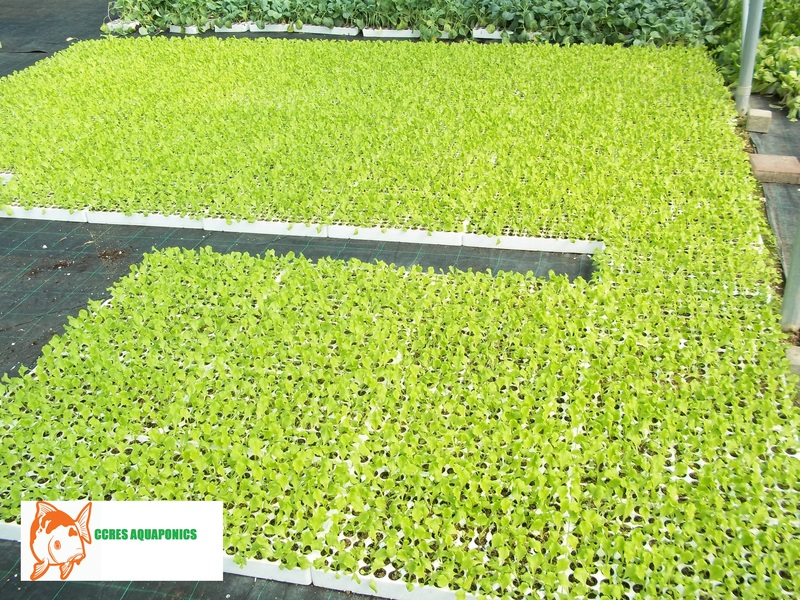 This type of biofilter probably comes closer to the ideal biofilter than any other type. A typical installation would be configured similar to a raceway. The filter media is installed in a long trough. The length of the flow path can vary based on the retention time required. By using a relatively high velocity, it is possible to insure plug flow. This is a big advantage over well mixed systems or systems with short retention times. 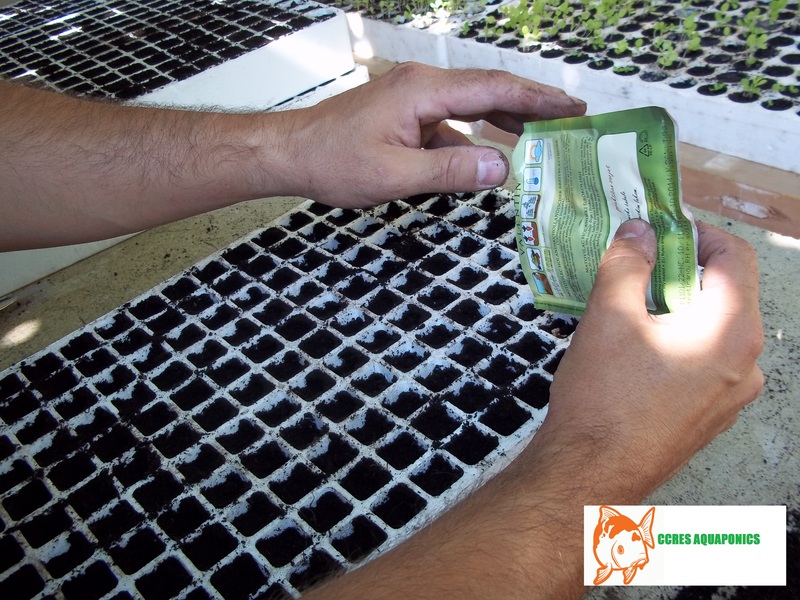 If it is not possible to remove all of the BOD before the biofilter, one will establish different zones in the filter. As nutrients are absorbed or removed in the first sections of the filter, different types of organisms will establish dominance in the zones where they enjoy optimum conditions. There are a variety of ways to configure a raceway type system. Here are a few examples Figure 3. Figure 4. Figure 5. Figure 6. Submerged filters can operate with or without aeration. 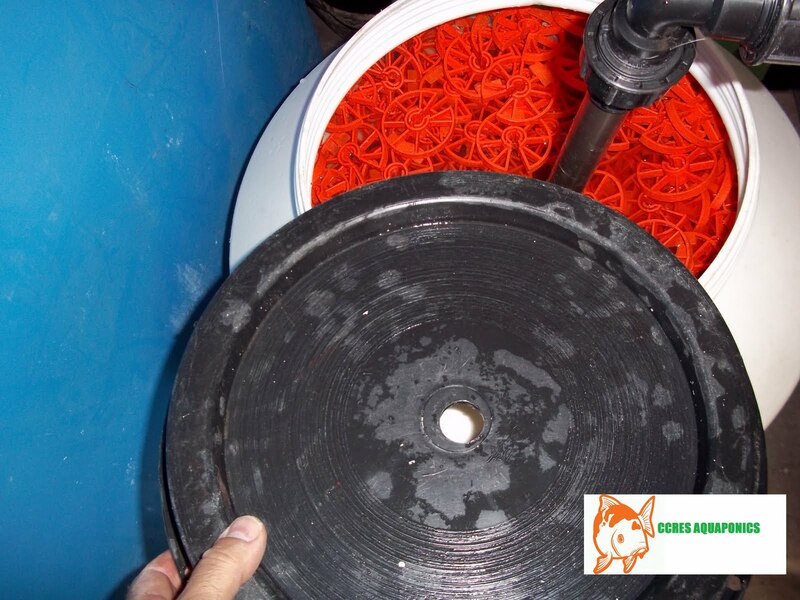 If the flow path is long and the nutrient loading is high, it is wise to have aeration in the filter. One of the easier methods is the traditional aeration system with large silica air stones. Sometimes it is not possible to use a raceway type biofilter system. If existing tanks must be used, it might be easier to build a system with internal recirculation. The advantage of internal recirculation is that it increases the velocity of water past the media and adds oxygen to the water. Increasing the velocity helps insure a more even distribution of water throughout the filter media and reduces the possibility of dead zones that are not receiving nutrients and oxygen. It also helps to keep particles in suspension. Suspended solids tend to settle out in areas of low water velocity. This is a problem because accumulations of solids can become anaerobic and contribute to poor water quality. Here are a couple of examples of internal recirculation systems. 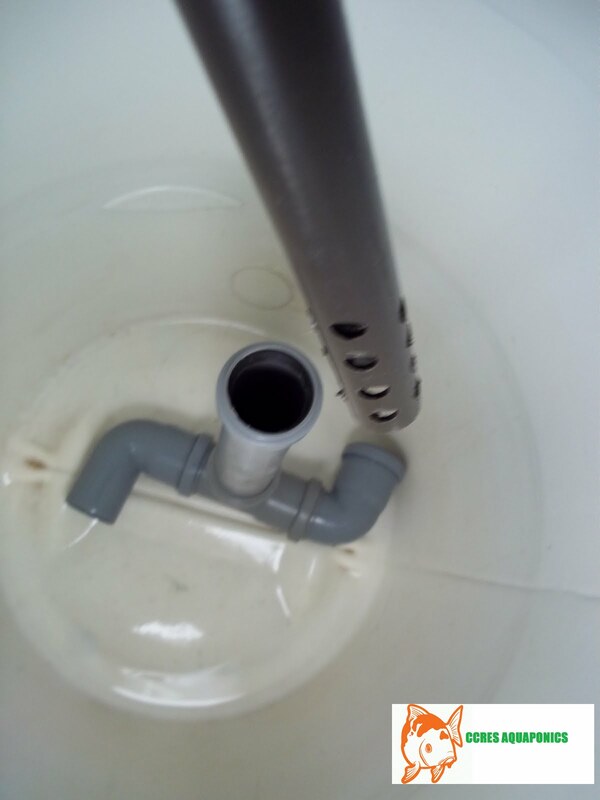 The cone bottom tank is preferred over the flat bottom tank because any solids that settle out will be removed immediately. Figure 7 Figure 8. There is always the possibility to install the submerged biofilter media in the culture tank. This has the advantage of saving the cost a separate vessel and associated piping. The big disadvantage to this system is that it is difficult to remove the suspended solids before the water enters the biofilter. Because there are too many different configurations to draw them all, here is a brief description of a few of the possibilities. 1. Air lift the water into one end of a filter designed as a raceway and air lift it back into the culture tank at the other end. 2. Pump the water into a particulate filter such as a rotary drum and then flow through the biofilter. 3. Locate tubes or columns of packing throughout the culture tank and induce a flow through them with air stones. 4. Locate the filter media around the walls of the culture tank and induce a flow up through the media with air stones. The number of possible configurations is limited only by one’s imagination. Part of the art of designing a trickling filter is to balance the competing requirements on the design. 1. In order to keep the energy costs to a minimum, the pumping head for the filter should be as low as possible. The maximum plan area covered by the filter is determined by the minimum water loading. 2. In order to minimize the floor space used by the filter, the filter should be as tall as possible. The practical limitations are the height of the building, the head limits on the pump and the structural and stability considerations of the vessel. 3. A taller filter will have a longer flow path for the water. This means a more complete treatment of the water with each pass. 4. Taller filters will have higher specific water loadings. This means better flushing action, more turbulent water films and higher ammonium removal rates. Trickling filters for industrial applications are sometimes 30 ft. tall. This is not practical for aquaculture systems. In general, trickling filters for aquaculture are between 4 and 10 ft. tall. Submerged Filters Submerged filters are excellent choices for small systems because they are very versatile. They can be located in a separate tank or in the culture tank. They can be horizontal flow, up flow or down flow. They can be aerated or not. The most important consideration for the design is the even distribution of water to the packing. It is very common for submerged filters to be designed as large, flat and thin sections of packing with water direction being up flow or down flow. There is typically no provision for distributing the water to all areas of the media. The length of the water path through the media is very short and the resistance to flow is very low. This is a recipe for disaster. The water flow will short circuit though a small section of the media and the rest of the biofilter will become anaerobic. Ideally the flow path through a submerged filter should be as long as possible. A long thin raceway is the best. This type of biofilter is known as a long path, plug flow submerged filter. Another possible alternative is the use of aeration to induce a circulating flow around a tank. The goal should always be to provide sufficient velocity through the media to insure a fresh supply of oxygen and nutrients to the bugs on the surface of the media. Pri samom razmišljanju i planiranju držanja tih veličanstvenih riba morali bismo znati nekoliko stvari o tim ribama – ponajviše o veličini koju dostiže (čak 100cm), prostora u kojem obitava te o adekvatnim uvjetima držanja i prezimljavanja. No najprije “lekcija iz povjesti”. Koi je danas nacionalna riba Japana, koja se drži za ukras. Mada prvi selekcionirani oblici datiraju iz predkristovskog doba, postoji teorija o njihovom putu do današnje postojbine Japana, zapisi i neke činjenice u kulturi naroda dalekog istoka, pa čak iz Perzije, od Kine i Koreje gdje se koi držao u konzumne svrhe. Kohaku, Sanke, Showa, Utsimorono, Bekko, Asagi, Shusui, Koromo, Kawarimono, Hikarimuyi, Hikarimoyo, Hikari utsuri, Gin rin, Tancho, Doitsu. Ako se odlučite za držanje koi-a važno je omogućiti tim ribama adekvatne uvjete. Pod tim podrazumjevamo veliki ribnjak, s obzirom da narastu i do 1 metar, a zabilježeni su i veći primjerci. Najbolji način za uspješno prezimljavanje, tj. stadij mirovanja (slično zimskome snu), za vaše koije je prirodni način. Pod tim podrazumjevamo pridržavanje nekoliko prqavila i pri samoj izgradnji ribnjaka vodimo računa o njegovoj dubini. Ako želimo gajiti te ribe moramo imati na umu kolko narastu i kakav životni prostor trebaju. Tako je i važan segment dubina koja kasnije u praksi dobro koristi za sami čin prezimljavanja ili vručih ljetnih mjeseci. Ona ne bi smjela biti ispod jednog metra, jer i sama gustoća vode na toj dubini iznosi 4 stupnja, što je dostatno da koi šarani uspješno prezime. Osim zimi, dubina pogoduje i ljeti, pa i pruža mogućnost gajenja bilja za dublju vodu (lopoč) i skrovište za ribe tijekom ljetnih mjeseci, kada voda premašuje temperature od 25°C. Zimi se koi šarani ne hrane, jer ne jedu. Važno je bilo posljednjih dana (dok su jeli) u prehrani opskrbiti vitaminske sastojke i proteinsku hranu da bi sam metabolizam ribe ojačao i spremio se mirovanje. Koiji miruju na dnu i troše zalihe hrane iz organizma, tek neophodno za preživljavanje. Osim prijašnje prehrane važno je bilo spremiti i okoliš. Pod tim podrazumjevamo (ako nemate slap il pumpu) šuplje vaze ili posude na dnu bazena radi koncentracije kisika u vodi (jer ribe i dalje dišu). Konstantno se buše rupe u ledu radi “disanja” ribnjaka i izlaska otrovnog metana. Pumpa, ili ako još imate element slapa, idealno će poslužiti da se voda ne zaledi i obogatit će bazen kisikom, kojega nema dovoljno, bez obzira što mu je u hladnoj vodi koncentarcija veća. Važno je i reći da, i kad završi period zime (temp. iznad 10 stupnjeva), da koijima treba opskrbiti vitaminsko bogatu hranu radi jačanja metabolizma i njihove reprodukcije. U našim područjima koi dostiže spolnu zrelost s 3-4 godine starosti. Reprodutivni ciklus započinje kod mužjaka u testisima razvojem spermatozoida, a u ženki u jajnicima razvojem jaja (ikri). Mrijest se očituje izbacivanjem ikre i mliječi, a oplođena ikra se lijepi za vodenu vegetaciju (ili ostale elemente akvarijju/ribnjaku).Ovisno o klimatskim uvjetima, šarani se mrijeste jednom ili više puta godišnje. U našim krajevima umjerene klime to se događa jednom godišnje – u proljeće kada se temperatura vode ustabili na oko 18°C. Spolno zreli mužjaci i ženke se okupljaju. šenkama je analni otvor odvojen od spolnog, trbusi im otvrdnu i nabubre zbog razvijenih jajnika. Neposredno prije mrijesta okolica se spolnog otvora zacrveni i nabrekne. Mužjak nema tako tvrd i nabreknut trbuh, a oblik mu je izduženiji. Analni i spolni otvor u mužjaka su zajednički, a tvrde žbice prednjih peraja hrapave su i odebljale. Kao sekundarna značajka kod mužjaka je “svadbenu ruho” (kvržice po prsnim perajama i glavi). 2.predriga s mužjacima i priprema za mrijest. Zrela jaja padaju u vodu okružena mnoštvom spermatozoida, a jedan od njih prodire u jaje i oplođuje ga. Sva jaja koja nisu oplođena u prvoj minuti ostanu neoplođena jer je pokretljivost spermija 30 do 60 sekundi, a opna jaja se zatvara unutar 1 min nakon dodira s vodom. Oplođeno jaje se počne razvijati. Važni su i vanjski faktori tj.osnovni (temperatura, sadržaj otopljenog kisika i svjetlosti) i stimulativni faktori (vremenske prilike sa stabilnim atmosferskim tlakom, prisutnost mužjaka i vodena vegetacija).Također je važna i odgovarajuća prehrana u to vrijeme (povišena razina proteina). Više informacija na :solarserdar@gmail.com. either as a small pond filter or a skimmer. What is the symbolism of KOI fish ? In Japanese symbolism the koi represents perserverance in adversity and strength of purpose. The strongest koi swims upstream until it reaches the final waterfall, where it vaults into the mists and becomes a water dragon. It depends on what you’re asking. Are you asking about the actual fish or the tattoo? It is said that the fish probably originates out of Persia (now Iran). Wild carp are called “koi” in Japanese. The term “koi” was later applied to all carp both wild and colored. The Japanese have a special word for wild carp called “Magoi.” Colored and inbred Magoi are called Koi. The Koi that have been bred for color are called “Nishikigoi”. Many Japanese use the word Koi to refer to wild carp. The term though has taken a secondary meaning in most of the world. Koi to most of the English speaking world means the colored carp which the Japanese refer to as “Nishikigoi” There are many different types of “Koi” Asagi, Bekko, Hakarimono, Hariwake, Karasugoi, Kohaku, Koromo, Matsuba, Sanke, Showa, Shusui, Tancho, Utsuri. They are some of the most beautiful fish. The Koi fish tattoo symbolizes.. According to Japanese legend if a koi succeeded in climbing the falls at a point called Dragon Gate on the Yellow River it would be transformed into a dragon. Based on that legend, it became a symbol of worldly aspiration and advancement. More generally, the Japanese associate koi (also known as carp) with perseverance in adversity and strength of purpose. Because of its strength and determination to overcome obstacles, it stands for courage and the ability to attain high goals. Others say it means good fortune or luck. Koi is a popular aquarium and ornamental pond fish. In China 7 golden Koi is good luck! The symbolism goes: the larger the koi, the richer you are. Those fish are expensive. According to tattoo websites, a koi represents good fortune, prosperity and riches. Also in Japanese culture, it symbolises male strength. It also says you are determined and don’t conform to what society expects – like a koi swimming upstream against the current. Koi are used to symbolize yin and yang in ponds. But all of the above answers are correct as well. Normally there is a balance of 1 black koi with 9 gold koi. People also use goldfish for this symbolization though. So it can just depend on who you ask. More info at: solarserdar@gmail.com. 墨 すみ sumi su-me Used to describe the black on koi. 当才 とうさい tousai toe-sa-eye Koi hatched this year. Here you will find a list of many of the types of Koi we breed and show regularly. A blue/grey koi with red on the belly, sides and fins. Back scales have rearticulating black on the edges. light brown to deep dark brown. A black based koi with a red spot on the head and black ban markings on body. A white based koi with a red spot on the head and black markings on the body. A white based koi with a red spot on the head. A scales koi, blue grey with dark blue scales on the dorsal and lateral scale. Red on belly and sides. A black based koi with a red and white pattern. A black bodied koi with a white pattern. A five colored koi, red, white, black, blue and purple. With rearticulating black on the edges of the scales. A white koi with black markings. A white koi with red pattern and black markings. A metallic white based koi with yellow/gold pattern. A metallic white based koi with red/gold pattern and rearticulating black on the edges the scales. Blue grey Body with yellow/orange or brown markings. A scaleless koi, black based with a white pattern. Other varieties are given an individual name such as Shusui and Kumonryu. Pearl Silver reflective scales.Gin Rin or Kin Rin scaling can appear on most scaled varieties of koi. A black based koi with a red pattern. black on the edges of the scales. A white based koi with a red pattern. More info at : solarserdar@gmail.com. Ki Bekko Mid 1800’s ? ? ? Original Sanke 1890-1900 ? ? ? Shiro Utsuri 1925 Kazui Minemura ? ? pH is in a range of 0-14. At the other end of the pH spectrum is the strongly alkaline property with a maximum pH value of 14. Solutions of caustic soda would be considered as strong bases or alkalis. A weak alkali is sodium bicarbonate in solution. This may be taken for upset stomachs or for baking cakes perhaps. Chemical reactions between strong acids and strong alkalis are extremely vigorous and give off large amounts of heat instantaneously. The stronger the acid the lower will be the pH. The other stream is in the south of England and is called the River Test. This stream unlike the Scottish one has been formed by rainwater which has first of all sunk into the ground through porous limestone and found its way through these alkaline passages and underground chambers to later find its way out of these chambers to form streams and ultimately rivers. It costs a fortune to fish for River Test trout because of the quality of water and the fact its high pH favours growth of aquatic plants and all life forms that depend upon these plants. This means a koi pond that is alkaline will support more life forms than one that is acidic. Almost all lifeforms re-energize as air or water temperatures increase and koi or goldfish are no different. The urge to start life afresh is there for all living creatures and organisms. Some start to spring to life earlier than others after a prologed rest over the winter months in the koi pond.